Determining proper food portion sizes is extremely difficult without a bit of guidance. It’s hard to eyeball your food to decide how big of a piece to eat, especially when you are hungry. Thankfully, there are tools out there to help us serve ourselves proper food portion sizes. 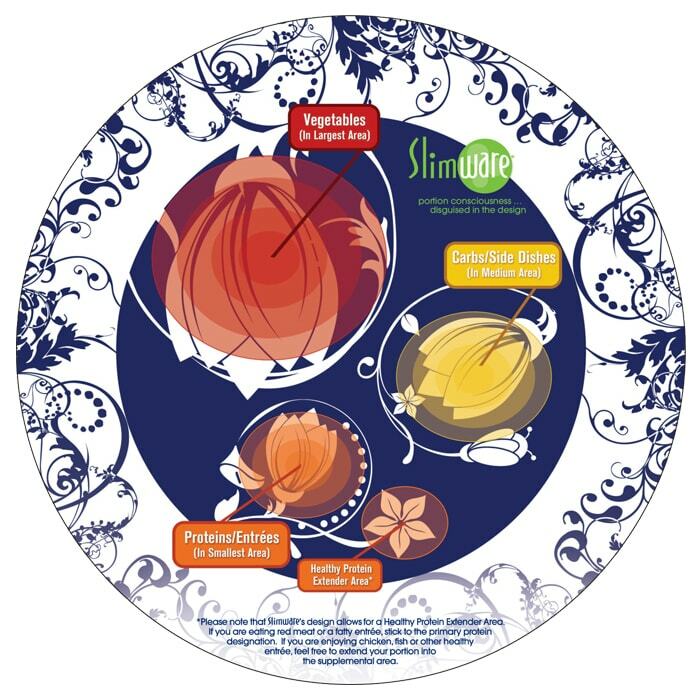 I received portion plates from Slimware for review, and this post contains affiliate links. All opinions are my own. During one of my many extreme diets over the years, I obsessively counted calories. I weighed my food and counted calories and nutrients on a quest to achieve the perfect balance. Well, you know what this doesn’t balance? Your mental state. That robotic behavior is not sustainable, and pretty much sets you up to fail. After I got tired of counting my calories in and calories out obsessively, I went on the ultimate junk food binge and undid it all. I learned a few things from that period, though. Weighing everything out like that made me realize how much our country suffers from portion distortion. We serve ourselves heaping mounds of food on our plates and go back for seconds. Once you get real with yourself and see what a healthy portion looks like, it can be quite eye opening. Another thing I learned is never to take a diet to that extreme again. There are plenty of products out there to help you without going overboard. 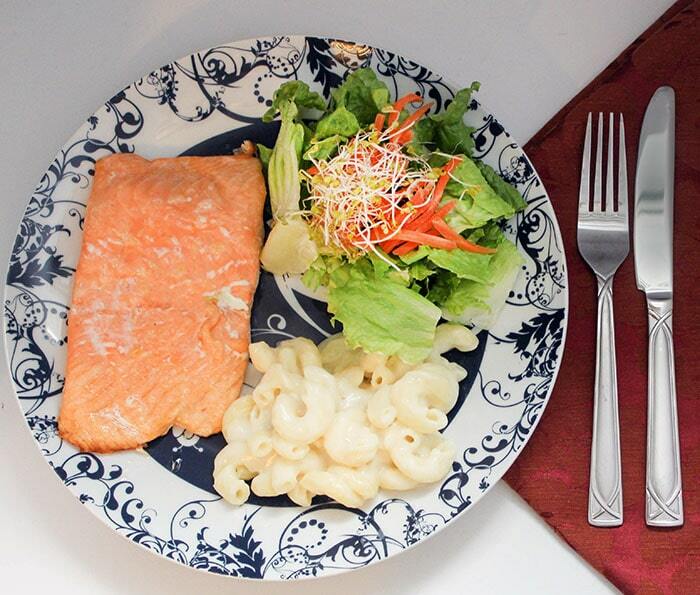 Portion plates from Slimware are such a no-brainer they can change the way your family eats every night with little effort. Many people asked me where I got the plates I used in this post. They are so eye catching and pretty that no one even guesses that they are subtly guiding you toward proper food portion sizes. Each unique swirly design is a portion controlled suggestion in disguise. The largest area is for vegetables, the medium section is for carbs, and the smallest design is for proteins/entrees. The tiny flower next to it is a healthy protein extender area, suggested for leaner meats like chicken and fish. Embraced by Hollywood’s body-conscious elite, Slimware fans include Elisabeth Röhm, Tori Spelling, Kendra Wilkinson, Emily Procter, Kathy Griffin, Rene Russo, Ashlee Simpson, Jennie Garth, Faith Hill, and Kristin Chenoweth. These plates are a major wake-up call to two people who have a habit of making steaks as big as a plate. :/ Mike and I both fill our plates with a lot more thought when using Slimware. Aside from the obviously useful portion guidance, the plates are also extremely high quality. 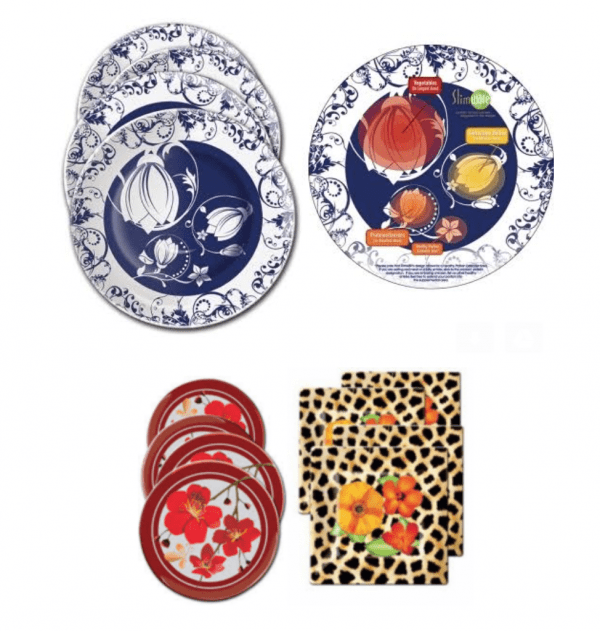 The ceramic dishes are microwave and dishwasher safe and come in many stunning designs. I possess some strange superpower that makes me never feel full. I can seriously eat more than my husband and not even flinch. Of course, I eventually feel gross and sluggish afterward, but it takes an obscene amount of food for my stomach to realize this. These plates are an excellent reminder for me to slow down, and remember that I feel better when I eat less. Especially now that it’s hot out, that stuffed feeling on top of the heat is not ideal. Slimware plates are proving to be a valuable tool in my portion control arsenal. Food scale – just not obsessively. Ice cube trays – completely underused portioning tool. 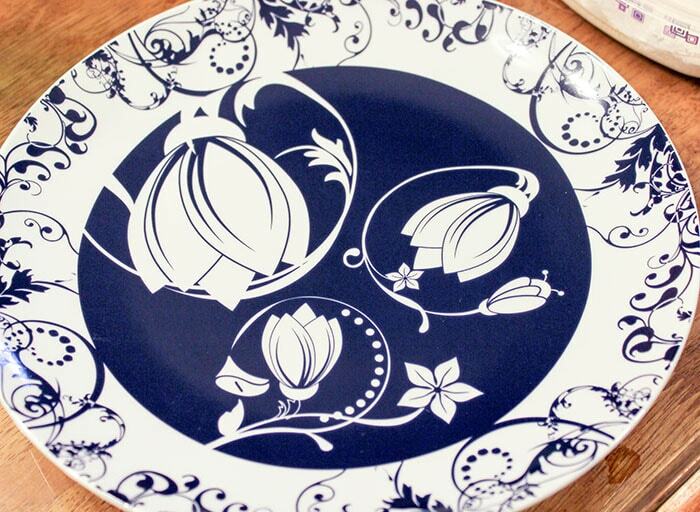 These plates might look magical, but remember that you still have to be mindful of what you put on them. Use them as a tool toward a healthier lifestyle. With smarter food choices and proper food portion sizes, you will be well on your way towards feeling great. This was very enlightening. I have never seen plates that help with portion control. I need to get a set of these plates for my husband and myself. These are awesome plates. They are not only pretty but give guidance with controlling portions. I’m a visual person and was never into counting calories so these plates make a lot of sense to me. What a seriously genius idea. I love how discreet they are. Plus, they are a great way to train yourself to eat foods in the right portions. What a great idesa I would love plates like this to help with my portion sizes. I always wonder about Proper Food Portion Sizes. 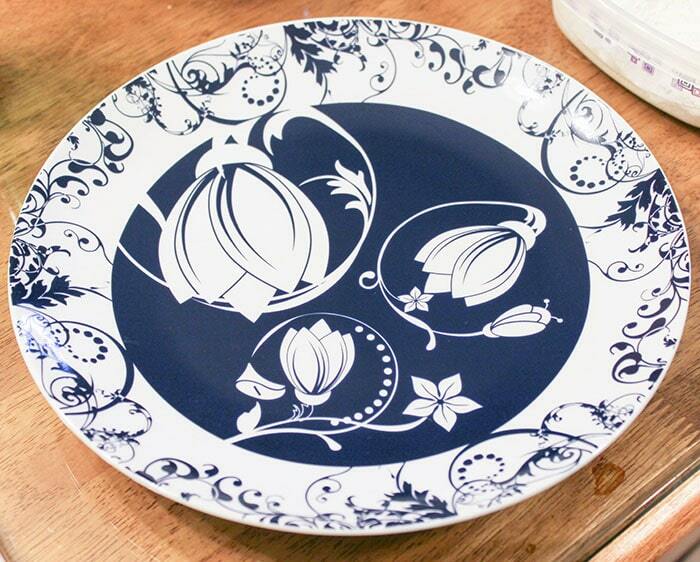 I love this dish, it is pretty as well as such a useful item! Those plates are very pretty and functional too. I love the way it shows you the ratio of carbs to veggies/fruits to protein for each serving. This would be great for people dieting or those who are diabetic that need to limit carbs. I’ve heard of bento boxes as we use those but never heard of plates that can help with portion control but it totally makes sense and such a great idea. I love this idea, this sure would help me get the right food portions and it is so cute! I tend to go over on the side portions, so this is great to know. I have huge issues with my portion control. I love to pile on the bad stuff and could use this reminder at dinner time. This is fantastic! I am a much more visual person, so things like this help more than trying to track exactly what is in everything.